In an earlier article I explained the background to topology optimization. The piece prompted discussion in the various social media, including requests to clarify the differences between Topology, Topography and Topometry optimization. I will explain in the article what the different methods do. However, it is difficult to distinguish between the terms based on normal language usage. Being an engineer, I like to know where things come from, as well as how and why they work. I had no clear idea what the three terms mean in general usage, other than we talk of topology in the context of maps and FEA mesh. Topography also has something to do with maps doesn’t it? As I write this, my spell-checker is happy with the first two, but topometry- forget it! The earliest clear definition I can find is a learned paper  written in 1912 by an American geologist defining these new (French!) terms. He takes 6 pages to explain that it is a classification that better defines professional standing! The pure science of land forms and shapes is topology. When considering usage in a ‘trade’ such as map making – it is called topography. When used for creating just local maps, it is called topometry. So how does that help us? Well I would suggest the following as a memory aid. Topology is the general 2D or 3D big picture. As explained in the previous column it uses 3D or 2D space to define an efficient distribution of material that takes load paths from application region to reaction region. Topography is 2D shell height mapping which can push elements out from a nominal surface to form beads or swages to increase bending stiffness and strength. Topometry is a 2D shell thickness mapping, which allows a free form distribution of thickness in a surface to vary stiffness and strength. It was generally known as free sizing optimization and the idea has been around for a long time. As I mentioned in the previous column my company, BAC, was using the approach in the 1970’s to evaluate wing skin thickness distribution. I believe the term was first used commercially around 2000 in the GENESIS product. I have asked some of the key developers in this area for the reasoning behind the terminology. Nobody is quite sure where Topometry came from! Let’s look more closely at Topography and Topometry. I discussed Topology in the last column. Figure 1. 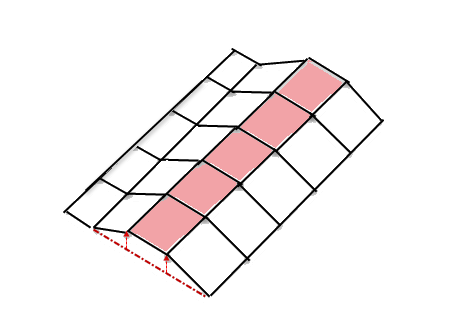 Line of shell elements offset from datum plane to form a bead. The method is a variant of classical element shape optimization. The nodal degrees of freedom, which define the design variables in shape optimization, are controlled by definition of the above input parameters. This is a neat way of overcoming one of the difficulties of shape optimization – how to control potentially hundreds of thousands of independent DOF nodal directions. Any of the formal optimization definitions for constraints or objective function can be applied to any response (stress, displacement, frequency, mass, etc.). This means that potential configurations that evolve using this technique can be rigorously checked, unlike topology optimization. However, it is very likely that the particular distribution of stiffening beads or swages will be too ‘organic’ and will need some tidying up too create a manufacturable component. A subsequent check will be needed on this cleaned up configuration. However, it usually does not drift too much from the original optimum. Each of these three techniques allows exploration of design configurations suggested by the optimization solution. All three can give very radical results, and each uses a different approach to the solution. Topology is truly the ‘wild child’. As described previously it can provide very creative designs which have to be ‘tamed’ after mapping to real designs and checking actual strength, stiffness etc. Topography is limited to 2D shells and can be controlled more. It may give hints on bead or swage configuration which are close to something we could actually make. Strength, stiffness and other criteria can be more closely monitored. It is more rigorous from an optimization perspective. Topometry is also limited to 2D shells and is rigorous – but is another conceptual tool. It’s purpose is to suggest distributions of thickness to give most efficient designs. The method is also described as Free Form optimization, which is really a better description. In summary all three ‘Topos’ are here to stay – particularly with application to additive manufacture. Today it is generally understood these are tools to explore creative new ideas – no longer the daydreams of a ‘daft lad’.